It's that time of year, folks. 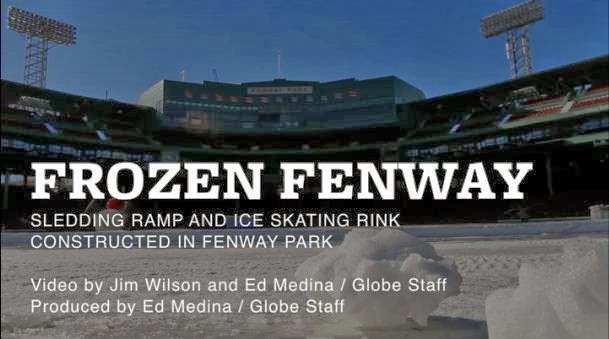 Frozen Fenway is here. This video, taken by Ed Medina and Jim Wilson of the Globe, details the construction of the rink and the sledding area for the games in time lapse. Definitely worth a look. Marquee match ups include Notre Dame vs Boston College and Merrimack vs Providence on the 4th, and UMass Lowell vs Northeastern and Maine vs BU on the 11th. Of course, the one I'll be looking forward to is Salem State University vs. UMass Boston on the 7th, because I graduated from Salem State in May. Planning to any of the games? Let me know on Twitter or leave a comment.